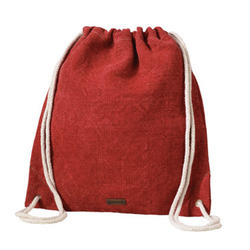 We are a leading Manufacturer of red drawstring backpack, cotton drawstring backpack and jute drawstring backpack from Kolkata, India. Owing to support of our adroit professionals, we have been able to provide a wide assortment of Red Drawstring Backpack. The offered backpacks are designed and manufactured by our experts with the aid of state-of-the-art techniques. These backpacks are extensively demanded in schools, colleges for keeping notebooks, books and other things. Moreover, our clients can avail the offered backpacks at nominal prices from us. 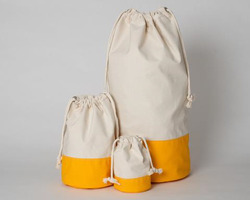 As a trustworthy organisation of this domain, we are committed to offering our clients a superior quality assortment of Cotton Drawstring Backpack. This backpack looks awesome and catches every eyeball in the market. The quality material and the strong stitching make the backpack highly durable and attractive. Furthermore, this backpack is available in a variety of sizes and shapes. Apart from this, provided backpack is made available at cost effective rates. 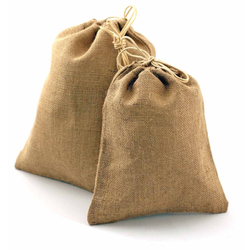 We are recognised as a distinct as well as noted name occupied in the offering of a wide collection of Jute Drawstring Backpack. This backpack is suitable to carry various personal belongings like camera, mobile, etc. The offered backpack is designed with many pockets on the side and one extra pocket on the flap. It is mostly cherished by customers for its antique look and rustic vintage design. Available in diverse sizes and designs, this backpack is beautifully stitched under experts' strict vigilance. Looking for Drawstring Backpack ?